David A. Bednar instructed us to invite the Spirit into our lives with the "same gentleness and tenderness by which He entreats us." 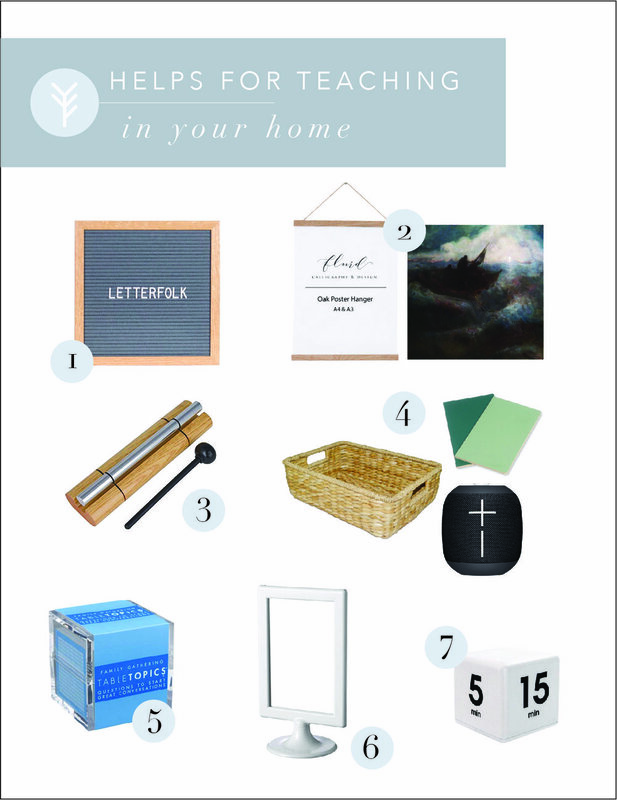 The following suggestions - some of which work for me and some of which have been recommended by my friends - are meant to provide inspiration as you ponder the best way to create and maintain a gospel-centered home for your family. If you feel like you need to make changes, do so under the influence of the Spirit. Integrate new patterns into systems and routines that already work. Don't be defeated by sick days, bad attitudes, or your own inadequacies. Be gentle on yourself! Do what works in YOUR family, and only keep that which helps you to be consistent and positive. Do it with love and a good sense of humor. Impromptu teaching opportunities, such as while you're doing your daughter's hair or buckling seat belts. Forget the hardback chairs and lecture halls! While there’s a time and place for prepared lessons, your whole house can be a classroom with your daily activities becoming the lesson material. The gospel can be like a golden thread that ties all things together in one, elevating our lives to become something holy. Learning together. The gospel is a feast, which means we come to the table of God's grace together! Invite your kids into your personal learning and they will discover how to learn, how to pray, and how to repent. Discussions with personalized applications. Some things can be shared in a family that can't be shared in a classroom. Cry together, pray for each other, and use real life experiences to actively live the gospel. Love, forgiveness, and compassion. A child whose heart is warmed by acceptance and understanding is like a sponge. If laughing and snuggling are preludes to gospel discussions, hallelujah! And particularly as children grow older, their growth and progress often comes through making mistakes, repenting, and forgiving. Allow them to fail. Allow them to grow. Allow them to reap the fruits of their hands, sheltered and secure in the bonds of your love. Deliberately cultivate the patterns and rhythms of your home life so that your daily activities take on spiritual meaning. This first, or spiritual, creation begins in your heart and manifests in your daily decisions, as well as in your response to circumstances you cannot control. Pray. David A. Bednar instructed that “meaningful morning prayer is an important element in the spiritual creation of each day—and precedes the temporal creation or the actual execution of the day.” The Spirit in your heart can influence the entire atmosphere of your home, just like the sun gradually warms the air we breathe as it rises in the morning. Find ways to orient your heart to Him, and watch the difference it makes when you start with YOU. Plan ahead so you can administer the gospel consistently but with flexibility. Finding balance in life is largely a function of putting first things first (meaningful things rather than urgent things) and then acting under the influence of the Spirit. Integrate new patterns and routines with what already works in your home. Use a binder, such as our Day by Day Spiritual Guidebook, or any functional calendar, to prioritize and track your spiritual goals and learning throughout the year. Consistent practice of small habits can yield great fruits in gospel learning. Keep records of promptings you receive for yourself as well as for individual members of your family in a special section of your binder so that you can notice patterns of instruction and direction from the Lord. Be willing to change. Ask yourself, "what needs to be removed from or added to my home and life so that the Spirit can abide?" Set your goals and review your calendar with these questions in mind, being fearless but loving in implementing the promptings you receive. “Therefore shall ye lay up these my words in your heart and in your soul ... And ye shall teach them your children, speaking of them when thou sittest in thine house, and when thou walkest by the way, when thou liest down, and when thou risest up. Consider the five senses. If someone walked into your home, what would they hear, see, smell, feel, and taste? What type of world have they just entered? Think about artwork, music and other media. Think about cleanliness, orderliness and beauty. And think about everyone having "a place." If you have kids, remember that they are the reason for a clean and orderly home, not the enemy of it (which allows you to embrace and submit to the messes of learning and living). Include your family members so that they feel ownership and take pride in the home that you make together. Track and reward progress and learning. Celebrate your successes! Keep in mind that these systems and motivational programs are simply methods to administer the gospel, and they may change as your family's needs change or as you get bored with them. Stay light on your toes and do what works to keep your efforts consistent, sustainable and joyous. Beautify. Diversify. Why is that we crave a new throw pillow or art on the walls? I believe that creating a beautiful space (rather than just a functional one) is a way to elevate our senses, to inspire and refresh daily living, and to draw us closer to our Creator. Without straying into the perils of Pinterest-obsessive perfectionism, find ways to make your home a refuge and a place of security in a chaotic world. Embrace the season of life that you are in and make it a haven of peace for yourself (and not just a neverending list of chores!) and for your family. Display Words to Inspire: Rotate quotes and scriptures on this amazing letter board to fill your home with uplifting sentiments! Rotate Meaningful and Applicable Art: Hang everything from the poster your child brings home from school to your favorite print of the Savior! Because these wooden art hangers are magnetic, you can change out the art you feature regularly. Ring in Routines: This little chime has been beloved by teachers for years as a way to call attention to the next activity without shouting. Could it work in your home? Absolutely! Call dinner, rally scripture study, gather for prayer, or let your kids ring it when they notice something positive or see an act of service. So many possibilities! Gather a Basket of Materials: If anything can kill our best desires to gather together for gospel learning, it can be the extra effort required to be organized. Try putting together a basket in a central location for morning or evening devotional, complete with manuals, hymnals, binders, artwork, scriptures, pencils, journals, and a family prayer list. Add to it a Bluetooth speaker for playing media to supplement your study, activities to keep little hands busy, and even snacks! Be careful not to complicate things. Just make it easy on yourself to be consistent. Keep the Conversation Alive: Keep this awesome box in your basket or at the dinnertable to access hundreds of family-friendly conversation starters. These questions can easily be tweaked to take on gospel application and lead to testimony-building opportunities. Use Nuggets of Time: This little time cube can help you get in your fifteen minutes of scripture study each day, and help your kids do the same! Teach through literature, poetry, music, art and history! Using a diversity of resources caters to kids with different learning styles, helps anchor principles in tangible memory aids, and spans age gaps in families. These resources may also be helpful in teaching values if your spouse doesn’t support formal gospel teaching in the home. Sing-Along is an app providing customizable slideshows and lyrics to familiar church songs, and you can always access art from the Gospel Art Library or media from the LDS Media Library. Invite your kids to make a slideshow or music video on a gospel topic. Encourage them to learn more about ancestors, church leaders, and historical figures of faith. Teach to the youngest, not the oldest (and let them teach)! The Savior taught simply and allowed the more spiritually mature to glean higher layers of meaning. We can do the same. Instead of teaching to the oldest kids and hoping some of it trickles down to the toddlers in your crew, teach simple principles to your toddler and ask your older kids to formulate thought questions, to come up with a role play or other application. They will naturally grapple with the material on their levels of understanding. Even better, let them teach each other. If you have primary-aged children, make sure you check out all the resources provided in their Primary Come Follow Me manual, and if you have teenagers, the resources available for For the Strength of the Youth are amazing! Include extended family. Devotionals or gospel discussions with extended family via Facetime or Skype can do a lot to give kids a sense of family identity and unity. Let cousins plan lessons together to give to joint family devotionals. Ask children to interview grandparents and share those stories in a family lesson. Invite friends or special guests to share a personal story or experience on a related gospel topic. The world is your classroom, even at home! Consider loop scheduling and memory-work rotations. If you’re thinking about memorizing scriptures, hymns, or quotes, consider this method or this app. If you’re thinking of implementing lesson material or activities on a rotational basis, consider this method. It relieves a lot of pressure to not cram everything in, but rather to rotate between supplemental activities, including service projects, family history and family testimony meetings. I know that it can feel overwhelming to think of all the things we could do when faced with the imperative of teaching the gospel in our homes. Our awareness of what others are doing can very quickly escalate into feeling that we should do all of the things we see happening around us. Don’t make that mistake! Having an “eye single” to the Lord is all about achieving a steady orientation towards Him, like following a line of light across the water. It’s not about having a perfect gospel lesson. It’s about using that lesson to redirect our attention to the Lord. Set your sails to carry you toward Him, lift up your eyes in faith, and you will find that your life and the lives of your family become filled with His light. Becca is the Director of Web Content at The Small Seed. She is here because she loves the Lord Jesus Christ and loves this community of women! She and her husband live with their five children in southwest Colorado where the mountains remind them daily to aspire to higher things.